EasyWay and the International Road Federation (IRF)* have signed a key Memorandum of Understanding (MoU) to seal recently held talks of enhanced cooperation in the field of Intelligent Transport Systems (ITS). Mrs. Sibylle Rupprecht, IRF Director General, and Mr. Ronald Adams, EasyWay Chairman, signed the MoU during the annual EasyWay Forum in Rome on Friday 11 November 2011. Addressing future challenges in preserving people's mobility and the role of smart technology as part of the solution was the topic for discussion during a joint IRF/ITS Netherlands Workshop on Mobility in 2030, held in Delft, the Netherlands, on Tuesday 20 September 2011. 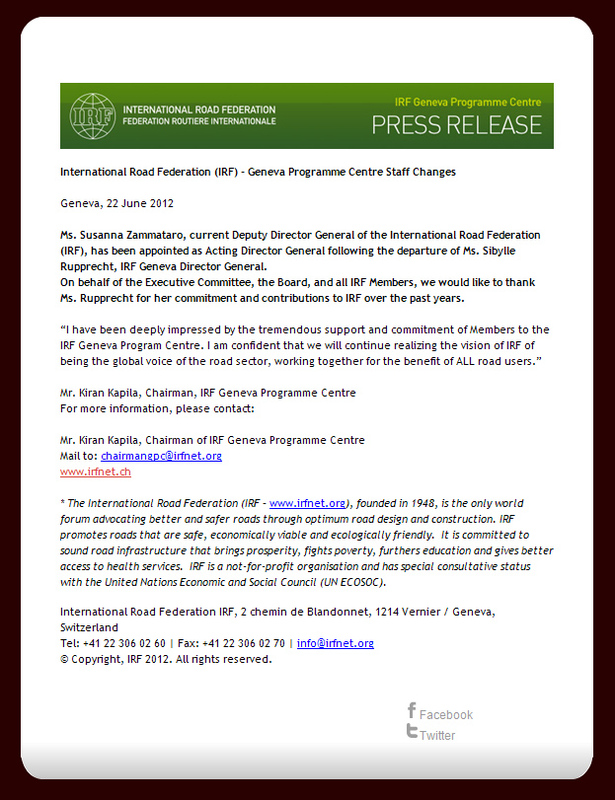 The International Road Federation, Geneva, Switzerland, has launched a new series of biennial themes by declaring Road Safety as its key focus for the years 2011 – 2012. During recent high-level meetings in Bucharest, Romania, the International Road Federation (IRF) organised a highly successful public launch of the United Nations Decade of Action for Road Safety. Geneva, 20 April 2011: The International Road Federation is proud to announce the winners of the first edition of the Innovation Award for Road Transport in Developing countries. This award recognises exemplary projects that have made real impact on transport in developing countries and rewards innovative, sustainable and good practices in this field. A major international congress devoted to Innovation in Road Infrastructure will be convened at the Holiday Inn Sokolniki in Moscow, Russia, from 22-24 November 2011. A landmark Policy Statement released today affirms the commitment of the International Road Federation (IRF) to the development of environmentally sustainable roads as an investment in the long­termprosperity of both planet and society. The 5th China National Forum on Innovative Highway Technology was convened in Beijing from 7-9 April. Organised by the China Highway and Transportation Society (CHTS) - a member of IRF - the theme for this year's forum was "Technical Innovation and Scientific Development on Roads". A meeting of the Black Sea Economic Cooperation (BSEC) Working Group on Transport took place on 24 March in Istanbul. It was attended by representatives from the Member States of Armenia, Azerbaijan, Bulgaria, Georgia, Moldova, Romania, Russian Federation, Serbia, Turkey and Ukraine. The Czech Republic and the Islamic Republic of Iran attended as observers. A number of BSEC sectoral dialogue partners also participated, including the Black and Azov Seas Ports Association (BASPA), the Black Sea International Shipowners’ Association (BINSA), the Black Sea Region Association of Shipbuilders and Ship Repairers (BRASS), and the Union of Road Transport Associations in the Black Sea Economic Cooperation Area (BSEC-URTA). IRF and IRU were present as international partner organisations.